MsgBox is an internal VBA procedure (method) used to display content within a dialog window that appears on the screen. It can be used to display the operand that we have directly transmitted or the values ​​of the variables that are calculated within the subroutine. 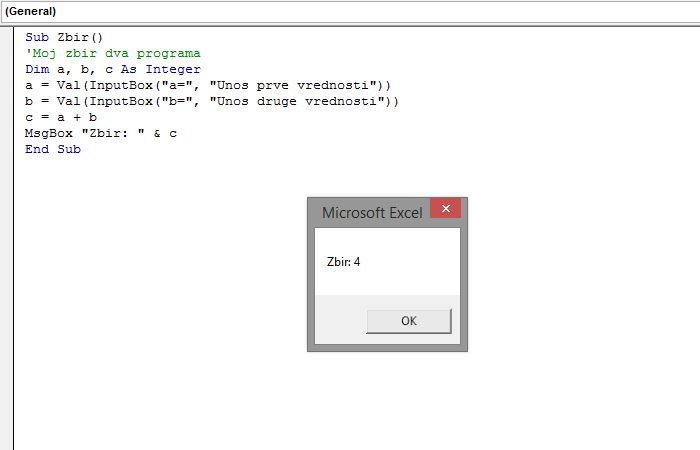 InputBox is a function that we use to enter values ​​that we will later use to calculate the expression. In the middle of this expression there is an internal constant vbNewLine that is used to switch output to a new line. InputBox returns Variant values, so it’s convenient to declare a variable by assigning the specified type to it. InputBox treats entered values ​​as strings, so if we want to execute some arithmetic operations over them, it would be useful to first convert them to a large value using the Val function.